These biccies offer a sophisticated twist on old favourites Jammie Dodgers.The unfilled biscuits will keep well for a couple of days in an airtight box. On a lightly floured work surface, roll the dough out to 3mm thick. Using a 6–7cm cookie cutter, stamp out as many biscuits as you can. Reshape leftover dough into a ball, re-roll and cut out more biscuits – you should get about 36 in total. Stamp out a 2–3cm shape from the middle of half of the biscuits. Arrange them all on 2 parchment-lined baking sheets; chill for 15 minutes. Bake on the middle shelf of the oven (in batches, if necessary) for about 15 minutes or until golden. Cool on the baking sheets for 1 minute, then on a cooling rack. When completely cool, dust icing sugar on the biscuits with holes in. Spread the whole biscuits with jam. 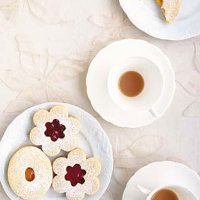 Press one sugar-dusted biscuit onto each jam-covered one and serve.